By now, you’ve probably heard about or know a few people who are selling stuff online. There are Ebay sellers, Etsy crafters, and people who buy and flip on Facebook markets or Craigslist. Maybe you have a friend selling services through the Jungle Market. Or you just learned that an old work buddy’s got a course up on Udemy. Of course, there’s also that one friend who’s living on the other side of the world, sitting in a hammock, and making hundreds of thousands of dollars: the Amazon seller. How Do You Become an Amazon Seller? Truthfully, there’s no one way to become an Amazon seller. Okay, sure, you have to go to the seller central part of the site and register to sell. We all have that in common. But what truly makes Amazon sellers different is how they source their products. Retail Arbitrage (RA) – A retail arbitrage Amazon seller is someone who finds under priced goods in retail outlets and department stores, then lists those products for sale on Amazon. They profit on the difference between what they paid for the product and what they sell it for on Amazon. While this practice was profitable a few years ago, recently Amazon put into place new terms and regulations which have made it difficult for retail arbitrage Amazon sellers to scale their businesses. Online Arbitrage (OA) – Similar to retail arbitrage, an online arbitrage Amazon seller is someone who finds deals and under priced goods online (instead of in stores) to list and resell on Amazon. Drop Shipping – A drop ship Amazon seller is someone who advertises the products of another business. When a sale is made, they notify the business and that business ships the product on behalf of the Amazon seller. This means that the Amazon seller does not have to own any inventory. 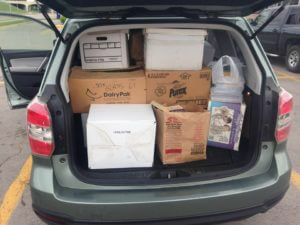 While it might seem like it is inexpensive to get started with drop shipping, because there are low barriers of entry to getting started, competition is high and profits are low. Wholesaling – A wholesale Amazon seller is someone who buys products in bulk at a significant discount to sell on Amazon. Often, these products are preexisting Amazon products. Ebook Writing – While not an Amazon seller in the traditional sense, ebook authors make up a significant portion of the Amazon seller community. Private Label (PL) – Finally, the private label Amazon seller is someone who creates their own products, sources the product, and sells it on the Amazon platform. Private label, in our humble opinion, is by far the easiest to scale and most profitable method of Amazon selling there is. Additionally, Amazon encourages private label and offers plenty of resources for aspiring entrepreneurs to build their own brands directly on Amazon. This is the method we will focus on in The Genius Series. In April of 2015, I drove to a Carl’s Jr. and paid someone $500 for 10 boxes of dusty, old books. Those books, along with my comic book collection were the first products I ever sold on Amazon. The first products I ever listed on Amazon–books! I sold books for about four months and then tried retail arbitrage (which I wasn’t a huge fan of) and then online arbitrage (which I still enjoy from time to time). It was not until I discovered the private label method that I really started turn profits. In November of 2015, I quit my full-time job to focus on finding profitable private label products. My first product, a stainless drinking flask, launched February 17, 2016. It was an immediate success! To this day, it still produces an evergreen income of $500-$1500/month. Not the best I’ve had, but definitely nothing to scoff at! Since then, I’ve created products that have earned as much as $9,500 in gross profit in a single month. My first batch of private label products. Note: air freight (which you’ll learn about later) can really beat up your inventory! The private label process is simple. First, you research a profitable high-demand/low-competition product on Amazon. Once you’ve got the perfect product, you contact an overseas manufacturer to create those products, typically in quantities of 500 or more. After the supplier manufactures your product, you ship it to your location and send it to an Amazon fulfillment center. From there, Amazon takes over as your “virtual employee” with their fulfilled-by-Amazon (FBA) program. Probably the coolest part of selling on Amazon is that Amazon has its own in-house fulfillment program. 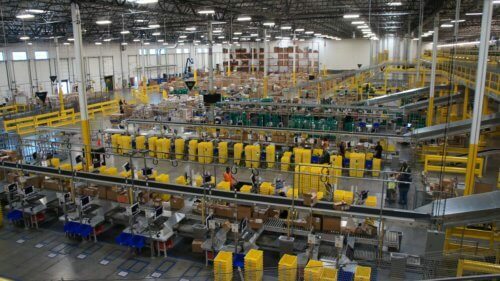 No matter what you’re selling–be it retail sticks of deodorant, dusty used books, or your own branded canoe–Amazon’s fulfillment centers handle all the hard work. After you send your inventory to Amazon, they will store, pick, pack, and ship your orders, then handle customer service on your behalf. 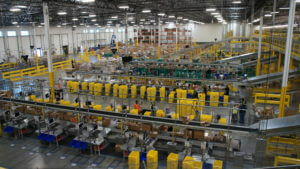 One of Amazon’s million acre fulfillment centers. Since Amazon FBA makes fulfillment so easy, all you really have to focus on is marketing and advertising. How Much Does a Private Label Amazon Seller Make? As a private label Amazon seller, you will want to find products that sell roughly 300 units per month, or 10 per day. While that may sound like a lot, hundreds of thousands of products on Amazon sell at that quantity and often much higher. Amazon spent a long time building market trust, giving up profitability for its first six years in business. These days, Amazon serves billions of customers all over the world. It is the largest online retailer by revenue. Because of its incredible popularity, some of Amazon’s top-selling products sell as many as 15,000 or more units per month. My top selling product sells 300+ units per month. And our Jungle Stix product sells over 1,000 units during the spring and fall high seasons. So, it’s no problem finding products with that sort of sales volume. In this series, we’ll show you lots of cool ways to find lucrative product niches. Most of the products we encourage every new Amazon seller to sell can be sold for $25-$50 USD. We discovered that this price range makes it easy to cover direct costs like Amazon’s fees, cost of goods sold, and advertising costs. Any higher than $50, and your conversion rate–the percentage of people that see your product and purchase–drops. Plus, your product will fall under higher scrutiny and potentially attract poor reviews (more on that later in the series). We recommend the lower and higher price points for advanced sellers. Amazon FBA Fees: Amazon ships the products for you, but you pay the shipping fee. Fortunately, those costs are low, generally $4 or less. Amazon Referral Fee: Amazon also takes a piece of your profit. While each category varies, for the most part the referral fee is 15% of the sales price. Cost of Goods Sold: When you calculate your profit, make sure you subtract the actual cost of the item. When sourcing, we suggest that your product cost is 1/5 or less of your target sales price. Other Direct Costs: There are other costs to consider, too, such as the cost to ship your product to Amazon, the product’s sample costs, and more. Advertising Costs: Amazon’s search engine uses its own pay-per-click advertising service called Amazon PPC. In your calculations, you will need to subtract these direct costs as well. We suggest you earn at least $10 in gross profit after subtracting all fees. At a $35 sales price, that would be a 28% gross profit margin, which is about what we get on average for our Jungle Stix product. So if you have a single product that’s selling 300 units per month for $10 in gross profit per unit, that’s $3,000 in gross profit per month or $36,000 per year. Not too shabby for a little research and marketing, eh? Many sellers go on to grow their private label FBA business by adding more products. Many find that whilst some products really fly and rake in the profits, others may coast along as a smaller, but still respectable, level of profitability. One thing that all private label sellers have in common, though, is that their product research is the most important step in order to find the right product opportunities, and to reduce the risk of failure. Here’s a little more in-depth look at the private label process. Keep in mind that over the coming weeks we will dive in deeper to some of these concepts. Product research is the most important phase of the private label process. To become an effective private label Amazon seller, you must find products that have high demand and low competition. Of course, Amazon’s catalog has millions of products. So, how do you know what to look for? Fortunately, Amazon offers up a ton of data for free that will help you make your decision. 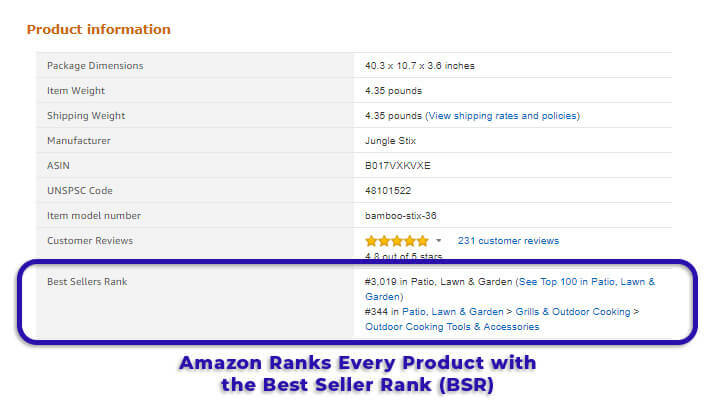 Amazon sorts every product in their database that has made at least one sale with its best-seller rankings (BSR) hierarchy. The lower a product’s BSR value is for a given category, the more units that product sells each month. For example, in Patio, Lawn, & Garden a product with 3,019 ranking sells an estimated 332 units per month. You can use our free sales estimator here on our site to estimate various products. Additionally, product reviews can help you find product opportunities. All you have to do is read what others are saying about your competitor’s products and improve upon them. Using a software application like Jungle Scout, you can easily track, sort and organize the BSR and Review data. Open your Google Chrome web browser. Once the search page loads, click the Jungle Scout Chrome Extension button. Review the data Jungle Scout provides. If the product meets your requirements, click the “Add to Product Tracker” button to add it to your Web App’s list of products. Using the Jungle Scout Chrome Extension, we can see that large bamboo skewers have an average of 435 sales per month, sell for $16.01 on average, and have 43 average reviews per item. Plus, we’ve given it a “5” opportunity score. While it’s demand is low, so is its competition. Throughout the Genius Series, we cover in detail the importance of effective research. We want to make sure that when you’re ready to dive in, you know exactly how to find profitable, evergreen products. Once you’ve discovered the perfect product to sell on Amazon, you need to find a way to create that product. The easiest and most common way to source your products is finding a manufacturer on Alibaba.com. Alibaba is a Chinese ecommerce, retail, and technology conglomerate. For the private label Amazon seller, this is a website which acts as a third party platform between private label businesses and global suppliers, wholesalers, and manufacturers. Alibaba is the largest internet retailer in the world measured by total sales. Alibaba has been around nearly as long as Amazon. It’s a safe and easy way for an Amazon seller to order products from original equipment manufacturers (OEM) overseas. Nearly all of Alibaba’s manufacturers are assessed and qualified by Alibaba and other third party assessors. Additionally, Alibaba offers a trade assurance program to protect Amazon sellers and buyers alike. 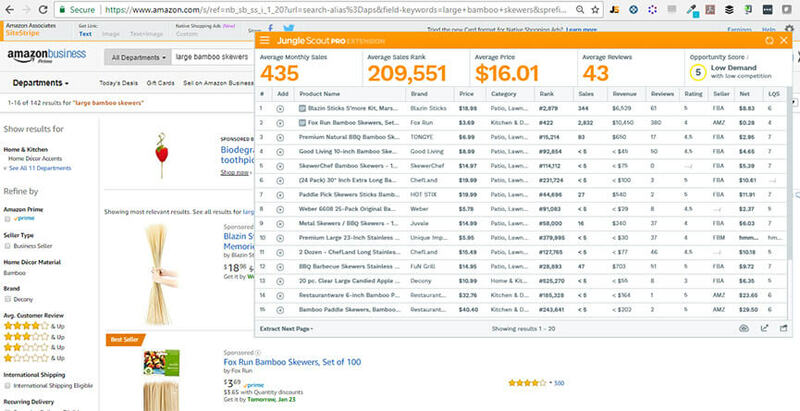 Research and find a high-demand/low competition product using Jungle Scout (see above). When the search results load, select the product that looks similar enough to the product you hope to sell. Review the information on the product listing. Here, I’ve put “large bamboo skewer” into Alibaba and immediately found manufacturers that can make this product. Sourcing is a huge part of becoming a private label Amazon seller, too. Therefore, in the Genius Series we cover everything you should know to effectively source and import your private label products. Product Design and Branding – It’s not enough to simply “cut and paste” an existing product and call it your own. As a private label Amazon seller, you will need to create a brand, too. Product Photography – Amazon product listings live and die by their photos. Your products will need top notch photography to stand out on the platform. Creating an Amazon Listing – Your product has never existed in Amazon’s database before. So you will need to create a new listing for it and optimize that listing for sales. Establishing Trademarks – While this step is optional, it does help in the long run to get a trademark on your product’s brand. Pre-marketing – You will want to let your friends, family, and fans know that you are selling a new product. Early sales will help increase your product’s visibility in Amazon’s database. Promotional sites like Jump Send make offer up inventive ways to get your products in front of thousands of voracious shoppers. 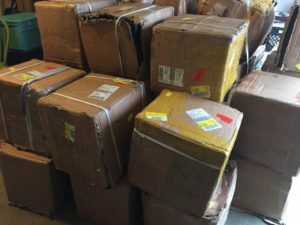 Quality Control – You may want to personally inspect your goods before sending them to Amazon, especially if starting with a new supplier. This may seem like a lot, but most of it is pretty easy, even without any experience. Naturally, we cover all of these elements in our Genius Series. Finally, once your product is in Amazon’s fulfillment network, you will need to get the word out about your product. Just having it in Amazon’s database won’t be enough. Remember, you’re competing with millions of other products for Amazon’s customers’ dollars. Amazon PPC – As I mentioned, Amazon’s search engine has its own advertising program called Amazon PPC. Amazon PPC uses a pay-per-click model. The way it works is that you bid on target keywords relevant to your product, usually $0.50-$2.00 per click. Depending on how much you bid, your product will appear in the search results related to that keyword. When one of Amazon’s customers click on your product’s ad, you are charged the amount you bid. Amazon PPC is one of the easiest (and affordable) advertising methods available to every Amazon seller. Promotions – Everyone loves a deal. By offering deep discounts on your product, you can not only introduce your product’s value to new users (and their friends and family), but also accelerate your product’s organic position in Amazon’s search engine. We use and recommend Jump Send to put our product promotions in front of hundreds of thousands of buyers each month. Social Media – We all know the power of social media. Facebook, Instagram, Pinterest, Twitter, and countless other platforms are a great way to let potential customers know about your brand and products. Mailing Lists – Mailing lists are still one of the most powerful marketing tools available to you as an Amazon seller. Once you’ve earned a lead’s permission to market to them through email (ie, they opt-in to your list), you have the ability to continually market directly to them without spending any money. Influencers – There are people out there who have the attention and trust of thousands and hundreds of thousands of fans. These influencers can assist you in making your product a success by reviewing, talking up, or simply using your branded item. The Genius Series will cover some of our favorite marketing tips, tricks, tactics, and strategies, too. Okay, I know. I’ve just hit you with the fire hose of information. But overall, it’s a pretty simple process. It takes time and perseverance, but it’s an accessible business model for many people. Find a product, source the product, buy and launch the product, then market the product. That’s it! All the little details are nothing to fear, and we’re here to help along the way. 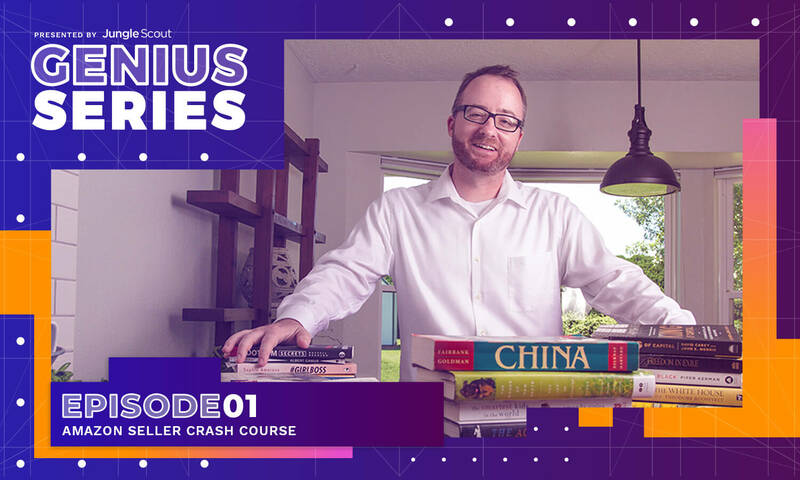 By the time you’re finished reading and watching all of the content we’re delivering our Genius Series, you, too will be an Amazon Seller Genius. Oh and by the way, if you are here as an existing seller looking for advanced tips, tutorials and guides, stay tuned. This series has something for everyone! Up next, we’re going to take a closer look at product research and product hunting, in Product Hunting 101. We’re going to share exactly how we do it in an exclusive video update, with the latest tips and hacks to finding the perfect profitable product. Very well written and informative for a prospective new Amazon FBA private label seller Kym!! Straight forward. Content flows well. Thank you, Dave. Hi Kym. I really love and appreciate the work that your team and you in particular are doing in general. I’m following the genius series but I am not getting this week series as yet. Could you please tell me if there is something wrong with my subscription. The email already went out for this week’s episode. Sorry if you missed it 🙁 I just checked the email system and you are definitely registered for the series, so make sure to check your other folders and spam and whitelist us so you don’t miss future updates :). There will be a resources page hosting all sessions coming out very soon! We are releasing new articles, videos, resources and guides every week for the Genius Series. To make sure you don’t miss a beat you can register yourself up here right here.